Glenn was born January 27th, 1961 in Boise Idaho. the first of 5 children born to Glenn R and Carla Mabey. he was raised in Boise, where he graduated from Boise High School. 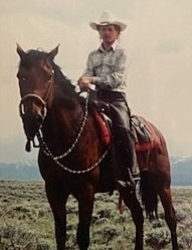 After high school, Glenn followed his love of animals and nature and lived in the beautiful valleys of Stanley and Challis Idaho along with several other small quiet Idaho towns near and dear to his heart. He loved animals and had many dogs and several horses over the years. At one time, Glenn owned his own farrier business and also trained dogs and horses. He crafted beautiful pieces of pottery and helped build many houses. Glenn was a jack of all trades, where he shared his many talents. He was truly loved and respected by many, many people. Glenn loved his friends and family and especially his 7 nephews and 2 nieces and 6 great nieces and nephews. Glenn never met a stranger and had a heart bigger than this world, gave freely of himself to everyone and was very service oriented. Glenn's friends describe him as a true gentleman, a man who loved life, a true cowboy and mountain man who enjoyed campfires, music, laughter, and storytelling, with a kind soul. He was an honest and hardworking man who was always grateful for all he had. He lived a simple life and his friends felt blessed to have shared this life with him. He was a nonjudgemental man and will forever live in our hearts. some of Glenn's favorite past times included reading, learning new words, studying birds, watching western movies and doing crossword puzzles. One of Glenn's favorite words was "magnanimous" The dictionary defines this as 1) generous and forgiving 2) noble, high minded 3) revealing generosity or nobility of mind and character. Glenn passed away January 25th, 2019, 2 days before his 58th birthday. Glenn was preceded in death by father Glenn R Mabey and his sister Ruth Mabey Close. Glenn is survived by his mother Carla Mabey and sister Afton Gunter, both of Syracuse Utah. Afton's 9 children and 6 great niece's and nephew's also of Utah. 2 brothers Nathan Mabey of Meridian Idaho and Evan Mabey of Boise. May you forever rip little buddy. Your beloved friends and family. There will be 2 celebrations of life events. the first will be held at the Fireside Inn on Saturday, February 9th at 1 p.m. with songs by Pinto Bennett and includes a pot luck. the second will be held at O'Michaels pub and grill 2433 Bogus Basin Rd. Boise on Sunday, February 10th at 3 p.m. It will include a pot luck, as well as memorabilia, music, and lots of shared memories of Glenn. Everyone is invited to attend. The cremation and arrangements are under the direction of Relyea Funeral Chapel.